Copyright � 2011 Dai et al. This is an Open Access article distributed under the terms of the Creative Commons Attribution License (http://creativecommons.org/licenses/by/2.0), which permits unrestricted use, distribution, and reproduction in any medium, provided the original work is properly cited. Background: Endogenous phytase plays a crucial role in phytate degradation and is thus closely related to nutrient efficiency in barley products. The understanding of genetic information of phytase in barley can provide a useful tool for breeding new barley varieties with high phytase activity. Methodology/Principal Findings: Quantitative trait loci (QTL) analysis for phytase activity was conducted using a doubled haploid population. 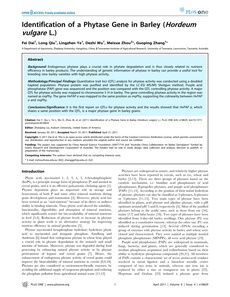 Phytase protein was purified and identified by the LC-ESI MS/MS Shotgun method. Purple acid phosphatase (PAP) gene was sequenced and the position was compared with the QTL controlling phytase activity. A major QTL for phytase activity was mapped to chromosome 5 H in barley. The gene controlling phytase activity in the region was named as mqPhy. The gene HvPAP a was mapped to the same position as mqPhy, supporting the colinearity between HvPAP a and mqPhy. Conclusions/Significance: It is the first report on QTLs for phytase activity and the results showed that HvPAP a, which shares a same position with the QTL, is a major phytase gene in barley grains.